It's so cool when I see pics from MSG or Nassau Coliseum. I was 10 in '75 and really didn't know Elvis. But I've gone to both places hundreds of times for other shows and ALWAYS try to imagine Elvis in concert there. Thanks for the awesome pic. Great picture from our King. It was Elvis last presence in The Big Apple (25 miles away from Manhattan, MSG), and it was his last 5 star tour (with the exception of the 5 days tour from December 1976). It marks the end of an Era. Those are some mighty big shorts! 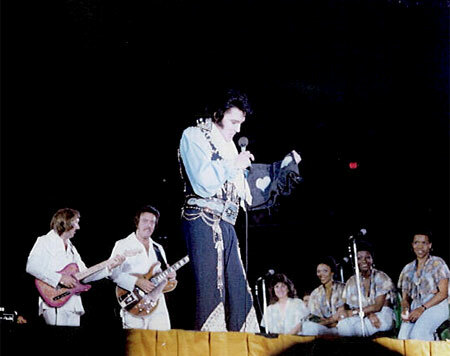 oh by the way, I know the name of the girl, who gave Elvis those shorts, that he's holding in this hands, because he announced her name !! Her name was Joanne !! A few minutes later he found a bra on stage and asked Joanne, if the bra, was also hers? He was having such fun with the audience. I went to the afternoon and evening show, at the Nassau Coliseum on July 19th 1975. I was barely a teenager at the time. Elvis, was in great voice and seemed to be really enjoying himself. We the audience, couldn't get enough of him. So many times, over the years, I have wished, I could go back in time, and once again, be sitting in the audience at these 2 concerts. It was such a fun time ! I miss you Elvis !!! Happy to see this photo as it was only time I ever saw Elvis in Person. Thanks! Great Pic !